I love this project. I may have seen it in a store or magazine somewhere - nothing is ever really original. But in my mind - it's all mine! I took an old pair of Ed's jeans (I never throw potential project materials away - ALAS!) and cut off/sewed shut the bottom of the crotch area (OUCH!!!). Then I padded a plastic utility basket inside and out with a sheet of fiberfill. 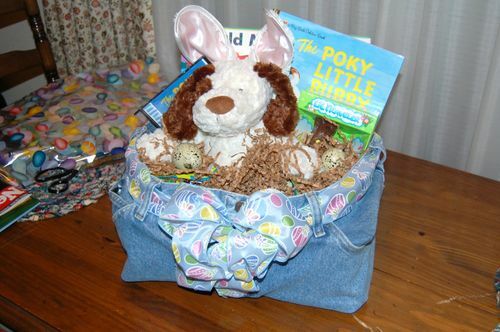 I filled the basket with shredded grocery sack raffia, one of my favorite books - The Poky Little Puppy, a CD of the PPLP story, a look-alike floppy puppy (temporarily wearing rabbit ears), and a few treats and other fun books.